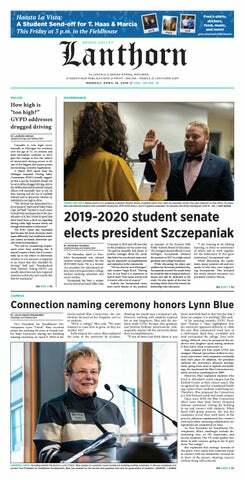 When I saw the Thursday Lanthorn emblazoned with the words “Going beyond the gender binary” right on the front page, I immediately became excited. I expected some exposé on the difficulties that trans and/or non-binary people face every day. I expected to hear folks like me bemoaning the challenges of navigating this campus while also trying to stick it to the binary. As I started to read the article, my excitement began to wane. Of course, when I saw that the university is trying to utilize a new system to allow sites like Blackboard to use preferred names instead of birth ones, I was elated. When I read that it had taken them two years to get to this point, I was less so. Speaking from experience, the way things stand now being a Laker and also being trans is an experiment in inconveniences. I had a problem last year related to my birth name in places that it didn’t need to be, and I was shuffled from one end of the campus to the other, speaking to no less than 10 or so people before I ended up in the office of someone who could fix the problem. So, I’m glad to see that in the future, when this new system is implemented for Blackboard, other people won’t have to spend half their day going back and forth from the Student Services Building to Zumberge, retracing their own steps and getting more and more distraught. Getting the use of preferred versus birth names fixed is pretty nice. But there are still so many other problems that plague us trans and non-binary people on a day-to-day basis. First of all, there’s the subject of pronouns. I have yet to see a professor outside of the WGS department ask the students in their class what their preferred pronouns are. This, to me, seems like it should be first day of the semester stuff. When the professor hands out index cards or whatever and asks for information like a person’s year and major, it seems like they could ask for pronouns as well. Because it’s nerve-wracking to go up to a professor that you don’t know and try to explain your gender identity just to get them to start using the right pronouns- if they start using the right pronouns. I have friends whose requests for use of the pronouns they/them have been met with flat out disregard. Who knows then how professors would react to requests for more “radical” pronouns like ze or hir? And then there are bathrooms. There are a few gender neutral bathrooms on campus, but they are usually hard to find and not every building has one. When the university was revamping Kirkhof just this last summer, it could have been easy to include a gender neutral bathroom along with the ones for those who adhere to the binary. Yet, as far as I know, there isn’t a single gender neutral bathroom in sight of Crave. I realize that these problems- and so many more not even mentioned- will take time to repair. And with the new name system, there is some hope stirring in my bosom that we as a university might reach a point where folks like me might actually feel comfy on campus. But as it stands, maybe we as a collective should stop assuming that everyone we meet is either a man or a woman, and maybe we should learn from and talk to trans people about their experiences, instead of speaking around them.